Israeli forces continued with systematic crimes, in the occupied Palestinian territory (oPt), for the week of 08 – 13 November, 2018. New Israeli Military Esclation in the Gaza Strip: Israeli warplanes carried out dozens of airstrikes, launching 197 missiles at civilian buildings and military sites belonging to Palestinian Armed Groups. 2 Palestinian civilians were killed and 20 others were wounded, including 5 children and 4 women. Many civilian facilities, residential houses, and security sites were targeted and completely destroyed. During the reporting period, Israeli forces killed 4 Palestinian civilians, including 2 killed during their participation in the Great March of Return and Breaking the Siege Protests while the 2 others were killed during the escalation the Gaza Strip witnessed in the middle of the week. Moreover, the Israeli forces wounded 172 civilians, including 27 children, 15 women and 4 paramedics. In the West Bank, a person wounded succumbed to his wounds while Israeli forces wounded 17 Palestinian civilians, including 9 children and a paramedic. The Gaza Strip has witnessed a military escalation, where the Israeli forces have unprecedentedly used warplanes and artillery shells since the 2014 offensive on the Gaza Strip. This escalation has started after an Israeli special undercover unit “Mista’arvim” infiltrated the day before yesterday, 11 November 2018, Khan Younis in the Southern Gaza Strip and killed 7 members of the Palestinian armed groups, mainly a commander in al-Qassam Brigades from Khan Younis, creating a state of maximum alter among the Palestinian armed groups and tension among the Palestinian civilians. This undercover operation was followed by barrages of rockets launched deep into the Israeli towns adjacent to the Gaza Strip. 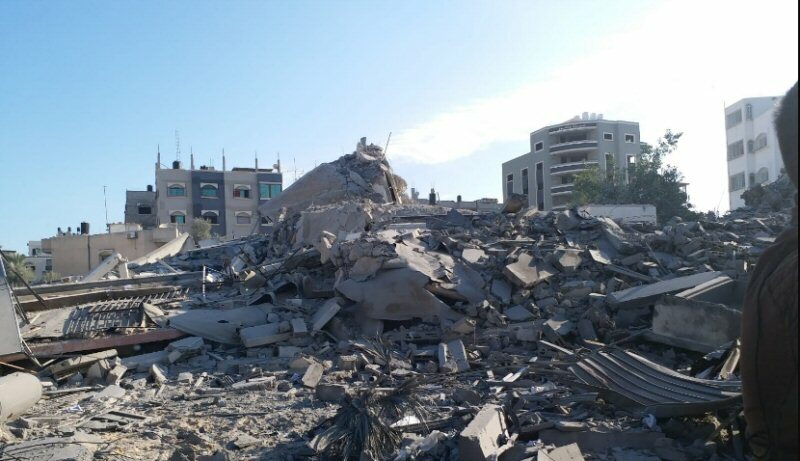 Since Monday afternoon, 12 November 2018, and until the reporting period, upon a decision by the highest Israeli military and political echelons, the Israeli forces carried out intense airstrikes against many civilian facilities and residential houses in addition to sites belonging to the security services and others to the Palestinian armed groups, launching at least 40 missiles. The Israeli artillery shelling also targeted the areas adjacent to the border fence with Israel. Due to the hostilities, 2 civilians were killed and 20 others were wounded, including 5 children and 4 women in addition to the destruction and severe damage in many residential houses, other civilian facilities and security sites. As part of using excessive force against the peaceful protests along the Gaza Strip borders, on 08 November 2018, the Israeli forces killed Mohammed Abu Sharbin (20) from Rafah City after wounding him with a bullet that hit his upper chest and exited his back during his participation in the Great March of Return and Breaking the Siege protests in eastern al-Maghazi in the central Gaza Strip. On 09 November 2018, the Israeli forces killed Rami Qahman (28) while participating in the Great March of Return and Breaking the Siege protests in al-Shawkah village, east of Rafah in the southern Gaza Strip after being wounded with a bullet to the neck. In the same context, during the reporting period, the Israeli forces wounded 152 civilians, including 22 children, 11 women, and 4 paramedics. Three of those wounded sustained serious injuries. As part of the Israeli airstrikes, the Israeli forces fired artillery shells at sites belonging to the Palestinian armed groups along the border fence between the Gaza Strip and Israel. As part of targeting the Palestinian fishermen in the sea, the Israeli forces continued to escalate their attacks against the Palestinian fishermen, indicating the on-going Israeli policy to target their livelihoods. In the West Bank, medical sources at al-Istishari Specialist Hospital in al-Rihan Suburb declared the death of Mohammed Shreiteh (28) from al-Mazra’ah al-Gharbiyah, northwest of Ramallah, as he succumbed to wounds he sustained during his participation in the peaceful protests against settlements on 26 October 2018. The above-mentioned had been wounded with a bullet to the front side of the head, fragmenting part of his brain. in the same context, during the reporting period, the Israeli forces wounded 17 Palestinian civilians, including 9 children and a paramedic, in separate shooting incidents. During the reporting period, Israeli forces conducted at least 65 military incursions into Palestinian communities in the West Bank. During those incursions, Israeli forces arrested at least 18 Palestinians, including 4 children. As part of the Israeli house demolitions and notices, on 08 November 2018, the Israeli forces demolished a 200-square-meter residential house belonging to the family of ‘Ali al-Ja’bah in al-Za’im village, east of occupied East Jerusalem. Moreover, they demolished a room and surrounding fence belonging to ‘Ali Abu Jom’ah in addition to removing the foundations of an under-construction house belonging to the family of Mohammed al-‘Omari. As part of the Israeli settlers’ attacks against the Palestinians civilians and their property, PCHR’s fieldworkers in the West Bank documented 2 attacks carried out by settlers, in Salfit and Nablus. The settlers wrote hostile slogans against Arabs on the walls and vehicles in addition to slashing tires of 17 vehicles in Kafr al-Deek village, west of Salfit. The Central Gaza Strip: at approximately 16:30 on Thursday, 98 November 2018, Israeli soldiers stationed along the border fence between the Gaza Strip and Israel, east of al-Maghazi in the central Gaza Strip, opened fire at a group of Palestinian young men, who approached the border fence. As a result, Mohammed ‘Ala’a Mahmoud Abu Sharbin (20), from Rafah, was killed after he was hit with a live bullet that penetrated the upper side of chest and exited the back. Mohammed was transferred via a PRCS ambulance after it received coordination to a hospital where he arrived dead. The Israeli shooting and firing tear gas canisters, which continued until approximately 18:00, resulted in the injury of 21 civilians, including 6 children and 3 women. Sixteen of them were hit with live bullets and their shrapnel and 5 were hit with tear gas canisters. Hutheifah Mahmoud Hasan Abu ‘Aitah (27), from Jabalia, was hit with a tear gas canister to the back. In Gaza City: 55 civilians, including 5 women, were wounded. Twenty two of them were hit with live bullets and their shrapnel, 33 were hit with rubber bullets. Khan Younis: Israeli forces’ shooting at demonstrators, which continued 18:00, resulted in the injury of 43 civilians, including 4 children and a paramedic. Twenty one of them were hit with live bullets and their shrapnel, 17 were hit with tear gas canisters and 5 were hit with rubber bullets. The wounded paramedic was identified as Falasteen Khalid Qdaih (21), a volunteer paramedic at Youth Pioneer of Peace medical Team, was hit with a live bullet to the left leg. Rafah City: Israeli forces’ shooting, which continued until 17:00, resulted in the injury of 2 civilians, including a child, with live bullets. Medical sources at Gaza European Hospital in Khan Younis declared the death of one of them namely Rami Wa’el Eshaq Qahman (28), who succumbed to his wounds he sustained after being hit with a live bullet to the neck. At approximately 11 November 2018, a Palestinian civilian was hit with a live bullet shrapnel to the head during his participation on the March of Return activities, east of al-Buraij refugee camp in the central Gaza Strip. Following the Friday prayer on 09 November 2018, dozens of Palestinian civilians and international human rights defenders gathered on agricultural lands of “al-Resan” Mount area, west of Ras Karkar village, west of Ramallah in protest against the Israeli settlers’ attempt to seize and confiscate the land. When the civilians arrived at the abovementioned area, the Israeli soldiers fired live and rubber bullets, sound bombs and tear gas canisters at the protestors. As a result, Feras Samarah (33), a paramedic at Palestine Red Crescent Society (PRCS), was hit with glass shrapnel of an ambulance where she was present after Israeli forces opened fire at the ambulance. The Israeli soldiers arrested Fares al-Sayed Nasser (30) and Mohammed Manthoum Abu ‘Ayash (23) after chasing and attacking them with their rifles. At approximately 13:30 on Friday afternoon, 09November 2018, a group of Palestinian civilians moved from the center of Kufor Qadoum village, northeast of Qalqiliyah, into the eastern entrance to the village, which has been closed for 15 years in favor of the entrance to “Kedumim” settlement established on the village lands. The protestors chanted national slogans in the anniversary of the death of the late President, Yasser Arafat demanding end of occupation, condemning the Israeli forces’ crimes against Palestinian protestors along the eastern border of the Gaza Strip within “The Great March of Return and Breaking the Siege” activities. Minister Walid Assaf, head of the National Committee to Resist the Wall and Settlements, participated in the demonstration. The protestors threw stones at Israeli forces stationed behind sand barriers. The Israeli forces fired rubber bullets, sound bombs and tear gas canisters at them. They also raided and searched houses belonging to Jamal Saleh Jom’ah, Zhdi, Ahmed Shtaiwi and Khaldoun Abu Khalid ‘Obaid. The soldiers then topped the houses’ roofs and used them as watchtowers to monitor the protestors and fire rubber bullets and sound bombs. As a result, 4 civilians, were wounded, including child Sari Abdullah ‘Ali (10) who was hit with a rubber bullet to the right hand. At approximately 17:30 on Saturday, 10 November 2018, medical sources at the Istishari Arab Hospital in al-Raihan Suburb in the northern Gaza Strip, announced the death of Mohammed Ibrahim Shraiteh (28), succumbing to wounds he sustained during his participation in the peaceful demonstration against the Israeli forces on Friday, 26 October 2018, in al-Mazra’ah eastern village, northwest of the city. Mohammed was hit with a live bullet to front side of the forehead, causing a fragmentation to a part of the brain. Mohammed underwent 4 surgical operations in the abovementioned and he stayed in the Intensive Care Unit (ICU) in a deep coma until his death. At approximately 08:00 on Thursday, 08 November 2018, Israeli forces accompanied with a military vehicle and a vehicle of the Israeli Civil Administration moved into Kherbit al-Mofaqarrah, east of Yatta, south of Hebron. The Israeli Civil Administration officer handed Ahmed Mahmoud al-Hamamdah (45) a notice to evacuate his 5-dunum land under the pretext of State lands within 45 days. It should be noted that Kherbit al-Mofaqarrah is a residential compound. At approximately 03:00 on Friday, 09 November 2018, a group of Israeli settlers moved into Kafur al-Deek village, west of Salfit, and then wrote hatred slogans against Arabs on walls and vehicles. They also punctured the tires of 17 vehicles. PCHR keeps the names of persons whose vehicles were damaged. On Sunday, 11 November 2018, dozens of Israeli settlers with the Israeli forces’ protection moved into the Antiquities areain Sibistia village, northwest of Nablus. The village’s Council said that around 150 Israeli settlers accompanied with Israeli forces moved into the antiquities area in Sibistia village and stayed there for few hours before leaving. It should be noted that the Antiquities area in Sibistia village was under the Israeli incursions several times.